Soak your preferred Weber Firespice Wood Chips in water for 30 minutes. Set up your Weber Q for indirect cooking with a convection tray and trivet. Place the pre-soaked wood chips in the Weber Q Smoker Boxes, place the lids on and set the boxes at the front and back, either side of the convection tray and trivet. Please refer to your Weber Q Smoker Box Set handbook for further instructions. Lightly oil the salmon fillets, cherry tomatoes and garlic, season with pepper and a little salt, the capers will also add saltiness. Once the barbecue has preheated for approximately 25 minutes and the smoker boxes have started to smoke, adjust the burner(s) to the roasting setting. Place the lemon slices on the trivet to create a base for the salmon fillets. Sprinkle the salmon fillets with the capers and place on top of the lemon slices. Place the tomatoes and garlic on the trivet. Close the lid and roast for 15 minutes or until the salmon is cooked to your liking. 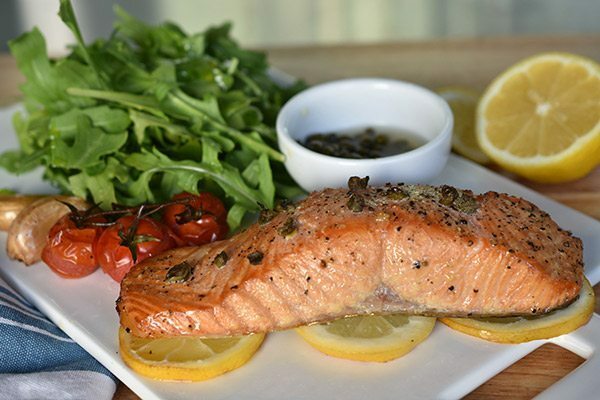 Lay approximately 3 slices of lemon in a row and place the salmon fillet on top. This will give your salmon fillets a lovely fresh lemon taste. For extra flavour, crush the capers with your fingers when adding them to the salmon. Hickory wood chips pair perfectly with salmon.